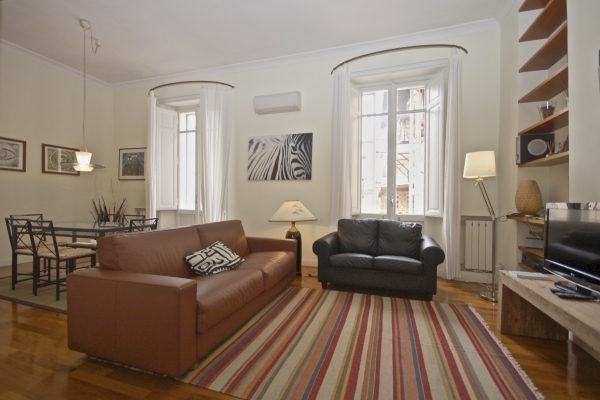 Comfortable apartment set steps away from the Coliseum, few minutes walk from Circo Massimo, in near transports that will allow you to reach the other parts of the city, near shops and restaurants. Independent heating, AC, cable TV, CD & DVD player, washing machine, internet, no elevator. The apartment at the Colosseum is located a few metrs from the famous monument, in fact just outside the main door you may admire the wonderful façade of the Colosseum.It is located on the second t floor of an ancient ‘800 century building, it is 90 square metres and consists in a large and pleasant dining and living area with double sofa bedrooms , kitchen, two bedrooms; the first with King size bed and the other one with double bed and two bathrooms. The large windows make the house very bright and from them you can see a part of the wonderful Colosseum. The apartment is located just a few metres from the Colosseum and the Metro station, from where you can reach most tourist areas in Rome. Godny polecenia, jakośc adekwatna do ceny. Wspaniała lokalizacja jest największym atutem.